The first season of DC’s Legends Of Tomorrow on The CW was a (mostly) fun romp through time, but its central villain—Casper Crump’s Vandal Savage—occasionally failed to live up to his villainous potential. 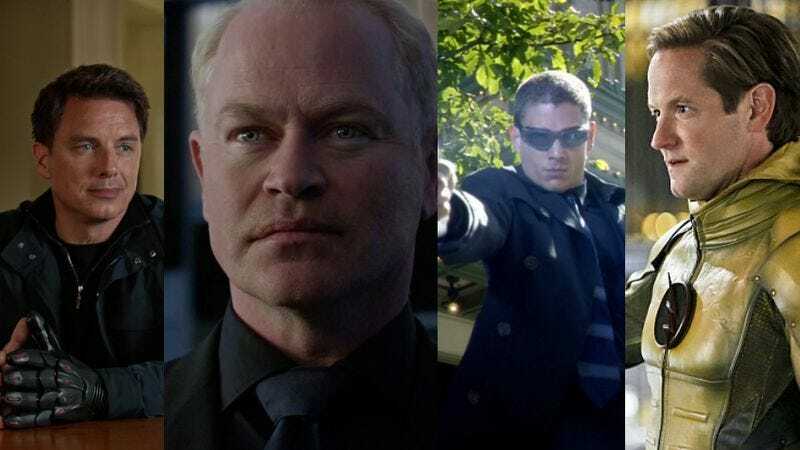 For its upcoming season season, though, Legends is going to make sure its villain game is on point by featuring not just one well-established CW baddie, but four of them: John Barrowman’s Malcolm Merlyn, Neal McDonough’s Damien Darhk, Wentworth Miller’s Captain Cold, and Matt Letscher’s Reverse Flash. Plus, if that’s not exciting enough, the producers are planning to call this association of antagonists The Legion Of Doom, a name that should be familiar to fans of a different team of DC heroes. This announcement came during the Legends Of Tomorrow Comic-Con panel this weekend, along with the news that a bunch more members of the Justice Society Of America will be appearing on the show as well. Last season’s finale introduced Patrick J. Adams as Hourman and a casting reveal in June had 90210’s Nick Zano playing Dr. Nate Heywood/Commander Steel, but now the panel has added Stargirl, Obsidian, and Dr. Mid-Nite to the list of Golden Age heroes we’ll be seeing next season. None of these roles have been cast yet, but their appearance indicate that The CW is serious about its take on the Justice Society. They also released a teaser for the season, and though it doesn’t have a lot of new footage, it at least looks like it’ll be as fun as last season.